Most homes in the UK have Gas Central Heating. This is where a Gas Boiler heats water to provide heating through radiators and hot water through taps in your home. 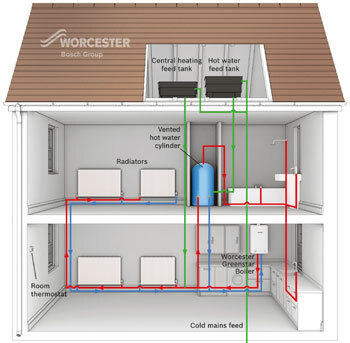 Central Heating Systems consist of the Boiler, associated header tanks, hot water cisterns and the pipe work that feeds the hot water and radiators. The system will also have some controls, pumps and valves. If you have an older boiler, it may be that you can save money by replacing your boiler, as new boilers have to be ‘Condensing boilers’. These new boilers typically achieve greater than 90% efficiency by condensing the water vapour in the exhaust gases and therefore recover some latent heat that otherwise would have been wasted. Buxton Heating are Worcester Bosch Accredited installers, which means we have a high level of experience and training with Worcester Bosch boilers; we are also able to effectively install other makes of boiler and components, should you wish to have a particular brand of boiler or if the situation of your home or boiler demands it. Buxton Heating can install both designer and standard radiators. We also recommend installing Thermostatic Radiator Valves (TRVs) if you don’t already have them, as these ensure each radiator can be controlled to the desired temperature, thereby saving you money and making your heating more efficient. These technical parts of your system are in fact just as important as the Boiler and Radiators, although they get less attention. Buxton Heating engineers will be able to specify and install the appropriate components that you need for your home. We can install basic Mechanical Timers for you to control your system. However, a programmable thermostat which allows you to set the temperature and water demands for each day of the week is a very popular option. Furthermore, we are also Nest Approved installers. The Nest smart thermostat allows you to control your heating from your phone or other device, anywhere in the world. Interestingly, the Nest system can also be linked to Carbon Monoxide detectors and even web cams. Our team of highly experienced gas central heating engineers install, service and repair systems across the region. From Godalming to Woking, Petworth to Petersfield, If your central heating is in need of attention or if you just have a central heating query call us today.